The paper proposes a new seismic sensor, recently panted, for vibrations monitoring on buildings in masonry and/or reinforced concrete. In particular the sensor is classified as an actuators on/off and is able to measure the accelerations of a generic structure by closing an electrical contact through the variation of the distance between two conductors. The latter ones are constituted by a disc that can freely vibrate inside of a circular ring. Sensor sensibility is obtained varying the distance between two elements according to a discrete sequence function of the vibration amplitude. In this way, remote control unity recognizes the vibration amplitude through activation of a defined sensor between those existing which can be calibrate according to a seismic scale. The sensibility of the system has been verified by developing of a multifactorial plane of tests obtained by varying vibration amplitude, frequency of excitation, and finally, simulating real earthquakes. The tests have been carried out employing a slip table driven by an electrodynamic shaker varying the diameter of the internal disk. The obtained results show that the sensor is able to acquire vibration amplitudes up to 0.085 m/s2 for the minimum tested diameter, independently from the direction of structure oscillation, moreover showing a reduced sensibility to the thermal and humidity variations. The test of structural parts or of the entire structure, the verification of the correspondence of the adopted materials and the processes of production, the static and dynamic stability of buildings in which yieldings of the foundations have been taken place, the ancientness of monumental works, are only some of the problems which technicians and testers are called to solve. Moreover the degrading action of the time, that one of the human activity tied to that of air and water pollution, the vibrations of the city traffic, fires, etc., act like a catalyst, impressing an accelerated course to building and monumental degradation. In such direction more and more the requirement of structural monitoring is felt to guarantee a safe use in the time with particular regard to those structures requiring many consolidation operations. With regard to this in the last decade it has been assisted to the development of an always greater number of sensors for monitoring the static and dynamic stability of complex structures. The approaches currently followed consist in adopting long-tested sensors  as accelerometers, capacitive transducers , acoustic emission , magnetostrictive , strain gage and more recently fiber optic [5÷7]. However the cost of such sensors as well as the management unit practically limit the monitoring to those structures whose importance plays a fundamental role . In order to overcome such difficulty it has been developed a low-cost sensor able to detect, in relation to the attended events, dynamic phenomena due to an yielding of foundation, a partial yielding of the structure, as well as to send real-time response. Such response must be independent from external temperature and humidity conditions. A further peculiarity of the sensor consists in the capability to discriminate environmental noises from those attended with a very simple calibration procedure. The sensor covers a very large range of vibration amplitudes varying in discreet way the sensibility of activation depending on structural characteristics and employed materials. 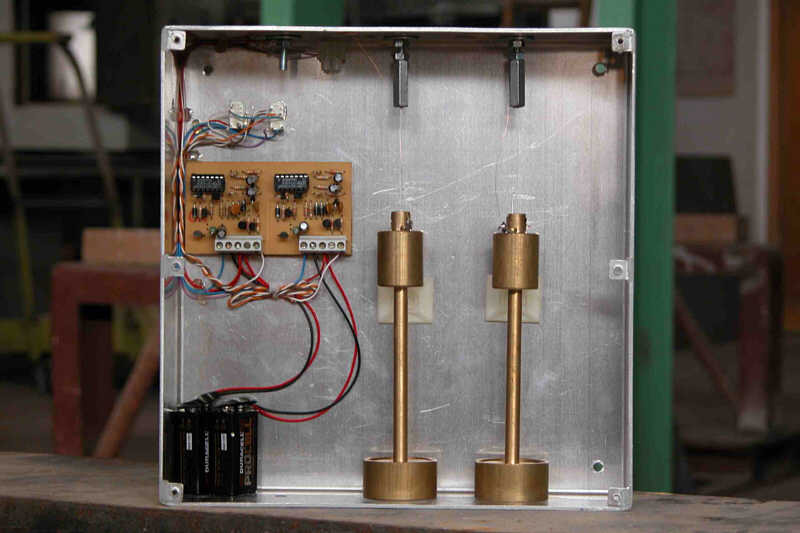 Fig 1: Box with two transducers and power supply and transmitting data circuits. The transducer is composed by an inertial system with two degrees of freedom showing a linear response until the activation. The latter is represented by the contact between a calibrated disk and a ring rigidly fixed to the structure. The sensibility of activation can be easily selected by varying the diameter of the disk and therefore by varying the distance between the free element and the fixed one. The contact between the two elements close an electrical circuit for a duration equal to that of the contact. In figure 1 the box with two transducers having different activation threshold is presented; in the same figure the power supply data transmitting circuits are also presented. A central processing unit completes the monitoring system and it is constituted by a receiver that modulates on a double-frequency quadruple-band in order to guarantee acquisition of radio signal sent from single (self feed) sensors, discriminating both the environmental noise as well as other radio emitters; in particular environmental noises are detected due to their duration and the number of activated transducers. The signal is acquired by a microprocessor able to store up to 500 single event on a RAM; moreover opportune algorithms supply the earthquake amplitude and duration according to one discrete scale. The system allows to send on line by GSM or telephone, the seismic data to a remote unit moreover concurring the print of time history. Finally, the equipment possesses a self-sufficient power supply which allow monitoring structures without electrical supply. Due to the large available selection of diameters and in order to reduce the experimental investigations, three different diameters have been examined; the selected ones correspond to the minimum (34.00 mm), middle (34.25 mm) and maximum (34.50 mm) in the range. These diameters have been selected by preliminarly dynamic tests on real structures and correspond to those usually adopted in monitoring of buildings in reinforced concrete. The experimental set-up is constituted by a vibration testing system Unholtz-Dickie model CSTA200 (amplifier TA206-330 and a slip table), able to 5.34 kN at 3 kHz. The transducer has been connected to the slip table by a steel profile able to guarantee a rigid connection (figure 2). 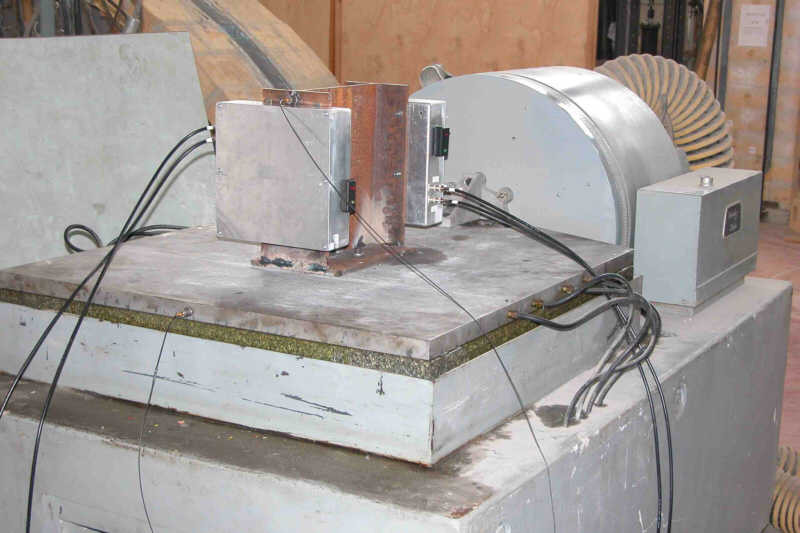 The acceleration acting on the transducer has been acquired by a piezoelectric accelerometer Bruel&Kjaer 4382S (range up to 5.84 kHz) fixed to the slip table; a second accelerometer of the same model has been connected to the steel profile in order to check the rigidity of the connection. All the signals have been conditioned and amplified by a Bruel&Kjaer Nexus amplifier. The input signals have been simulated by varying both the frequency and the amplitude and they have been sent to the Unholtz-Dickie amplifier by an HP-Agilent 3120A signal generator, while the output ones have been acquired by National PCI-MIO 16XE10 board on a MAC system. The block diagram of the testing system is sketched in figure 3, and it has been employed also for the simulation of real earthquakes. Fig 3: - Block diagram of the testing system. The transducer response has been characterized by performing an experimental plane, generating sinusoidal signals by varying the frequency and the amplitude until the uninterrupted activation of the transducer for two minutes has been obtained. The choice of a so long activation interval is due to the requirement of a correct transducer response even in the presence of a stationary signal whose duration is greater than the usual one of the earthquakes. In figure 4 the accelerometer signal as well as that of the transducer before and after the activation are reported. The frequency range investigated in the tests has been limited between 4 Hz, due to the experimental set-up, and 14 Hz as a usual upper bound of the spectral frequency of an earthquake. Fig 4: Signals of the slip table and of the transducer. The results obtained during the tests are reported in figure 5, in which the minimum amplitude required for the two-minutes activation of the transducer are reported versus the frequency. As it could have been expected, by increasing the diameter of the disk the resonance frequency decreases; the transducer response show an almost flat behavior for frequency greater than the resonance one up to 12 Hz, while for increasing frequency the three curve diverge. From the examination of this figure it can be recognized that increasing the diameter of the ring (i.e. decreasing the distance between the free and the fixed element of the transducer) the minimum required amplitude decreases, reaching a minimum value of 0.6 m/s2. Fig 5: Frequency response of the transducers for an uninterrupted activation of two minutes. A second experimental plan has been performed in order to test the transducer response when the input signals are ground accelerations of real earthquakes, that is for input signals having more frequencies and variable durations. Due to the characteristics of the vibration testing system this second plan has been performed only for two diameters 34.00 mm and 33.75 mm; the latter has been carried out in order to obtain a compared test even in the presence of low activation sensibility (figures 6). Fig 6: a) Denali earthquake ground motion and transducer response; b) PSD of the Denali earthquake. In table 1 the results of this second plan are reported. The ground acceleration signals have been downloaded from COSMOS Virtual Data Center. For each transducer and for each earthquakes the amplitude has been reduced multiplying by a constant factor K; the value of K has been characterized when the transducer did not activate during the test. It follows that table 1 shows the minimum sensibility detected. In the same table the meaningful frequency range of the spectrum of each earthquake is also reported; the latter has been obtained by selecting the lower and the upper frequency corresponding to an amplitude equal 1/10 of the PSD maximum; in the same table the frequency of the input signal at the instant of transducer activation is also showed. ( = 0.052) equal to about the 50 % of the corresponding one of the transducer with diameter of 33.75 mm. Regarding to the different values of the signal frequencies when the transducers have been activated, it has to be emphasized that this difference is due to the delay time of the activation instant of the sensors. This behavior is confirmed by the frequency response of the transducers (figure 5) which depends on both the amplitude and the frequency. Further, another parameter of difficult evaluation lies in the time history of the signal before the activation instant. Table 1: Fundamental characteristics of simulated earthquakes and of transducer responses. The results obtained show that the examined transducer possesses a great sensibility to earthquake, even when a wide spectrum range is presented; the sensibility decreases when the input signal is a long-duration stationary one and the uninterrupted activation of the transducer is required. The mean obtained sensibility, equal to 0.085 m/s2 for 34.00 mm diameter, allows to affirm that for greater diameters the sensibility will be surely greater. To this purpose, some other tests have been performed by reducing the mass of the disk obtaining a greater sensibility with the same diameter and by adopting the same input signals. The obtained results are clearly a first step in a further development of a transducer with a greater resonance frequency (greater than 10 Hz) with a flat behavior for frequencies lower than this limit. This will lead to a transducer sensibility independent from the frequency and depending only on the difference between the diameters of the free and the fixed elements of the transducer. In any case, the developed sensor lends for its economisation and sensibility to being used for the monitoring of complex structures, control of yieldings in foundation, overload verification and degradation of the structural materials. W. H. Ko, "The future of sensor and actuator systems", Sensors and Actuators A 56 (1996), 193-197. W. Kuehnel, "Modelling of the mechanical behaviour of a differential capacitor acceleration sensor" ,Sensors and Actuators A 48 (1995), 101-108. S. Koppel and C. U. Grosse, "Advanced acoustic emission techniques for failure analysis in concrete", XV World Conference on NDT, Rome, October 2000, 60. C. M. Teller and H. Kwun, "New methods for inspecting and monitoring bridge structures using magnetostrictive sensors", Review of Progress in Quantitative Nondestructuve Evaluation 13B (1994), 2147-2153. T.W. Ng and W.B. Yong, "Monitoring building shift using a robust speckle correlation encoder scheme", Measurement Science and Technology, 13 (2002), 803-806. J.G. Liu, C. Schmidt-Hattenberger and G. Borm, "Dynamic strain measurement with a fiber Bragg grating sensor system", Measurement 32 (2002), 151-161. M. Kimura and K. Toshima, "Vibration sensor using optical-fiber cantilever with bulb-lens", Sensors and Actuators A 66 (1998), 178-183. Q. Cao, W. Li and B.T. Yen, "VLSI signal processing for QNDE of highway bridge", Review of Progress in Quantitative Nondestructuve Evaluation 12B (1993), 2239-2244.